Are you looking for that perfect gift for the person on your list who enjoys camping, biking and hiking? And they REALLY enjoy doing these activities at US National Parks? We have found practical and fun gift ideas that feature US National Parks. 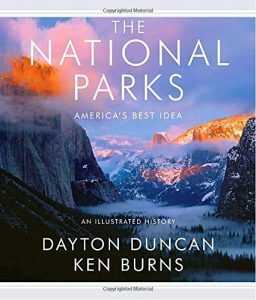 National Park gifts are perfect for the person on your list who enjoys adventure and photography at these fantastic US parks. The best National Park gift you can give anyone who enjoys outdoor adventure is the US National Park Pass! It only costs $80 – it’s the best adventure deal anywhere! It covers all passengers in a personal vehicle. It is valid for one year from date of purchase. Buy the pass at REI and they will donate 10% of sales to the National Park Foundation. You can also order passes online or get them at any of these Federal Recreation Areas. 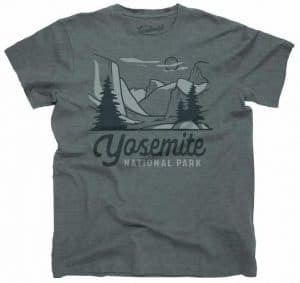 A cool National Park gift is stylish shirts, hats, sweaters and other apparel items. Anyone who loves the US National Parks will enjoy showing off their favorite national park with outdoor gear and apparel. 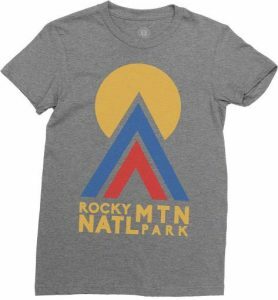 Parks Project Apparel from REI: with each purchase, they donate money to fund habitat restoration, visitor programs, wildlife conservation and more at the National Parks. 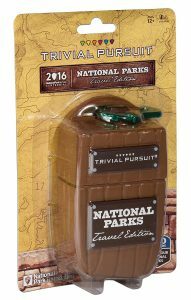 The most FUN gift National Park gift would be a game. It’s really fun to play these classic games with a National Parks theme! Jenga includes over 100 educational fun facts about the national parks engraved on the wooden pieces. Monopoly features over 60 national parks throughout the game and includes educational game matching animals to the parks they inhabit. 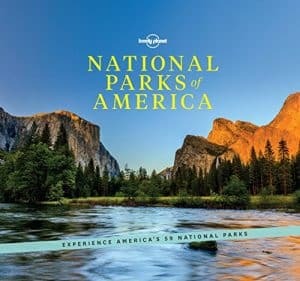 Trivial Pursuit asks 600 Questions about America’s National Parks with categories that include Natural Wonders, Battlefields & Historic Sites, Cultural Heritage, Science & Nature, Wildlife, and Wild Card. The best part is that a portion of the proceeds are donated to the National Park Foundation! REI also offers these National Park Edition Games. All outdoor adventures require water. 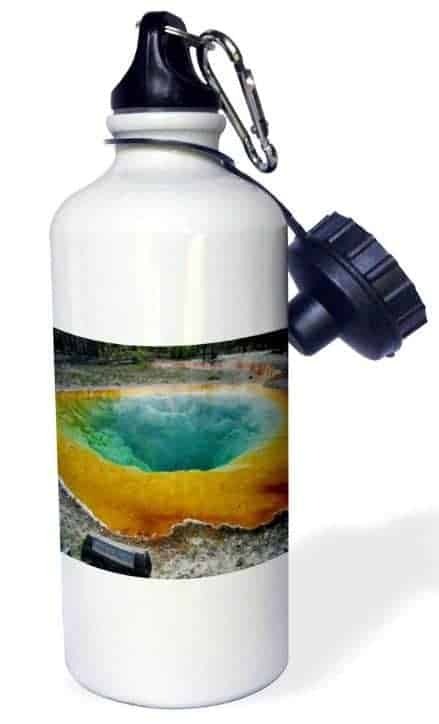 Sporting a water bottle with National Park scenes takes hydration to the next level! Water bottles are a cool AND practical National Park gift for that person on your list who loves the outdoors. CamelBak® is a proud sponsor of the National Park Service and $1 of every purchase is donated to The National Park Foundation. Photos of various national parks in a calendar is a terrific gift idea. 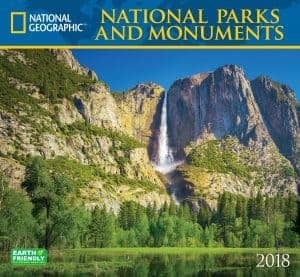 National Geographic Wall Calendar – This twelve month calendar showcases inspiring images accompanied by a large grid with moon phases and international holidays. National Geographic supports vital work in conservation, research, exploration, and education. 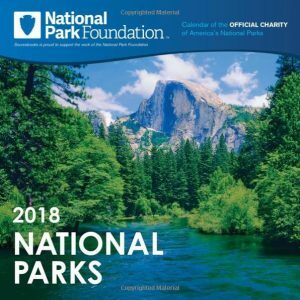 National Park Foundation Calendar – The National Park Foundation is the official charity of America’s National Parks. This wall calendar is filled with breathtaking pictures from America’s beautiful national parks. Each month showcases two photos of National Park Foundation-supported sites, plus detailed information about each. 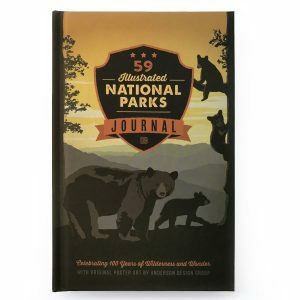 A travel journal is a National Park gift that will be cherished for years! Give a Gift Certificate if you’re not sure what photo and wording the recipient of the gift would want. 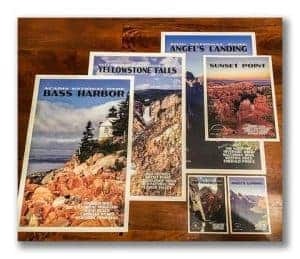 If you don’t have a photograph to turn into a poster, there are many posters featuring National Parks to choose from. 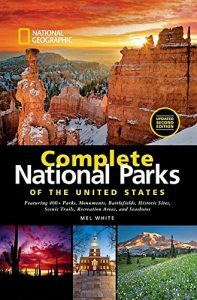 There are so many books and resources about US National Parks that are filled with color photos, detailed maps, historical background, location of the park system properties, best times to visit and top-rated activities. 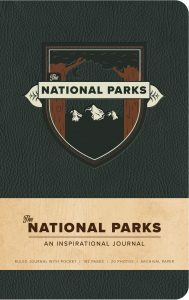 A wonderful National Park gift would be a guide book or packing list to help plan a future trip. Yes, it’s the digital age and everyone is using GPS or downloaded maps. But did you know that most of the US National Parks are in areas that get no cell service!? We ALWAYS have a back-up physical map ‘just in case’. 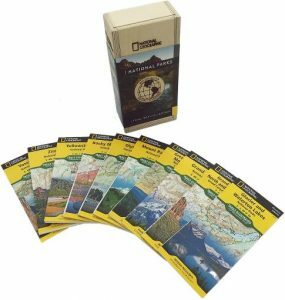 We use the National Geographic Illustrated Maps because they are waterproof and tear-resistant. 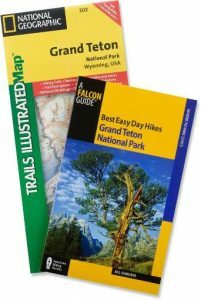 The topographic maps for the National Parks also include hiking trails and other useful information for the specific park. There you have it! Our list of fabulous gifts for anyone who loves the national parks. This is the perfect list when you need Christmas or birthday gift ideas for family and friends (or you!) who enjoy outdoor adventure! No way Monopoly and Jenga (more) has theme ones like that! Absolutely love the National Park Wall Arts, that would be the ideal for us to gift as if you climb or not, it’s magical on a wall! Then for the adventurer itself, maybe some books and guides are really thoughtful! I definitely think the travel journals are a great idea. I wish I could make myself use them more. Thanks for the tips. 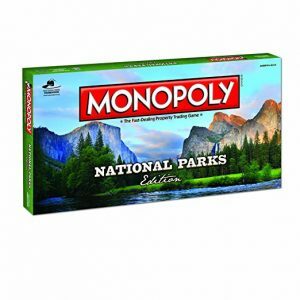 I need the National Parks monopoly, that is awesome. We are in the middle of planning our next trip to the States and trying to work how many of the parks we can get to. Any park you visit provides something amazing. Enjoy your trip! Yosemite reminds of of alexander supertramp. Love your list. The tshirt look amazing too. Someday i want to visit your country and get mesmerised ? All these gift ideas are so good! And I’m so in love with diaries and notebooks that I would definitely buy a travel journal! Also the guides are super cool! The America the Beautiful pass is a really good idea! An issue I always struggle with is how wasteful Christmas is. I’m always getting things I don’t really want, but a pass to the parks gives you an experience and joy for the whole year! YES! The pass would be the best gift for people who enjoy outdoor adventure! Some pretty cool gifts, I love a calendar and often use the photos after to frame or in projects. Travel journals or simply books to write in ..lol..I am all there and usually have around 3 on the go and these ones are truly gorgeous. Good idea to frame the calendar photos – or use for other projects! The American the beautiful pass is an excellent gift idea for outdoorsy people. I’d like one too, it’s a shame I’m not in the US! The nature notebooks are also a useful gift option, good tips here. Are there similar type passes for national parks in other countries? Love the research you have done here to create such a great list of gift options at this time of year. Also love how purchasing some of these items results in greater support toward maintaining these wonderful natural resources for us and future generations to enjoy. These items are also all wonderful reminders to encourage us to spend much more time in the great outdoors to enrich our lives. Thank you. We like to support companies that give back! What a great list! I love that Monopoly has versions for pretty much anything you can imagine. A good water bottle is a must for outdoor adventures! 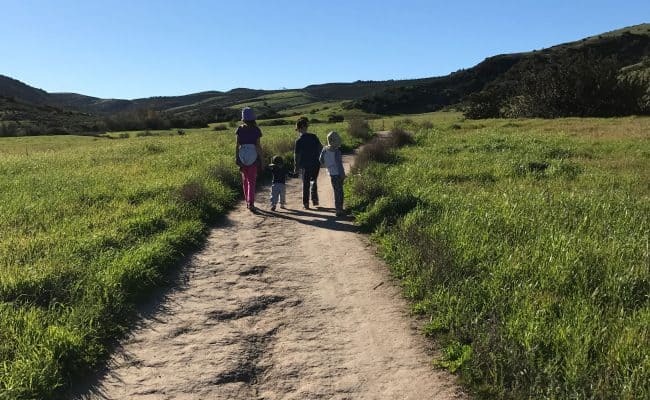 I personally use the Camelbak you mentioned as does my 6 year old and we love them! Camelbak waterbottles are always a good choice! I didn’t know National Parks gifts existed! this is interesting and I can think of a couple people would enjoy the wall art or monopoly game. And I completely agree with documenting your travels. Experiences are always interesting to read back on because you document all the details you may forget later on.